These colorful fish tacos are Mexican-restaurant-tasty. Sautéing, instead of deep frying, the fish keeps them healthy and simplifies the preparation as well. While there are quite a few ingredients (all of them low-FODMAP) the recipe comes together quickly and the cooking time is minimal. The light and crunchy cabbage slaw can be a stand-alone recipe as a side dish for any meal. In a medium bowl mix together the cabbage, scallions, radishes, lime juice, oil, salt, sugar, and cilantro (if using). Let the slaw marinate, stirring periodically, for at least 15 to 20 minutes. In a large bowl, combine the ancho chile powder, cumin, smoked paprika, salt, lime juice, and 1 tablespoon plus 1 teaspoon garlic infused oil and mix to form a spice paste. Transfer 2 teaspoons of this spice paste from the large bowl to a small bowl. Add mayonnaise to the small bowl and stir until smooth. Whisk milk into the mayonnaise until the mixture becomes a thick but pourable sauce, adding more milk if needed. Set aside. Cut fish into ¾-inch slices. Add fish to the large bowl with the spice paste and stir to coat. Heat a large skillet over medium-high heat. Add the last teaspoon of garlic-infused oil to the skillet, tilting the pan to coat with oil. Add fish pieces, scraping in any spices and liquid from the bowl and cook, stirring gently until fish is cooked through and flakes easily, 3 to 5 minutes. Place tortillas on a microwave-safe plate. Use a second plate of the same size and place it upside down over tortillas to make a lid. Microwave tortillas on high power until hot, soft, and pliable, 1 to 1 ½ minutes. 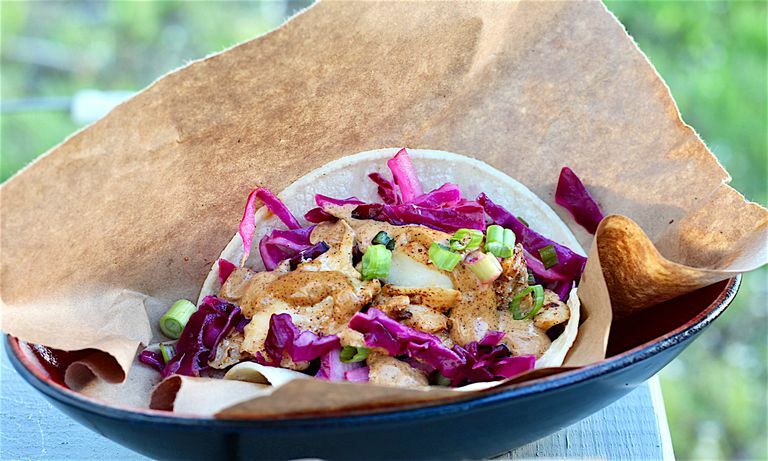 Top each taco with 3 or 4 pieces of fish and 1/3 cup Mexican Slaw; drizzle with Spicy Taco Sauce. Serve with plenty of napkins. If you like plenty of heat, add 1/4 to 1/2 teaspoon cayenne pepper to the spice paste before adding oil and lime juice. Time saver: use pre-packaged shredded cabbage or coleslaw mix from supermarket produce section. Use crunchy corn tortilla or tostada shells if preferred, or warm soft tortillas on a lightly greased griddle. This recipe assumes the use of a mildly spicy ancho chile powder. If yours is too hot, reduce the amount to achieve your preferred heat level. The slaw can be made several hours in advance and held, tightly covered, in the refrigerator.